In Unitarian Universalism, you can bring your whole self: your full identity, your questioning mind, your expansive heart. Each time we gather we create a home for Open Minds, Loving Hearts, and Helpful Spirits. We invite you to join us Sundays for worship at 10:00 am and coffee and fellowship at 11:00 am. We are a Welcoming Congregation: We invite, welcome, and celebrate people of all ages, races, ethnicities, cultures, sexual orientations, genders, levels of education, and economic status. Our facility is wheelchair-accessible and several designated parking spots can be found close to the front entrance. Whatever is comfortable for you. Depending on the season you will find sweaters and blue jeans, shorts and t-shirts, shirts and ties, pants and blazers, skirts and blouses, or “Sunday best” attire with even a hat or two. Children should wear comfortable clothing. They may play on the floor, work with art supplies, or go outside. What will I experience on my first visit? Upon arriving, greeters will welcome you in the foyer. There you can find out more about our congregation, pick up a name tag and other printed materials about our faith. You can expect a warm welcome from folks who are glad to get to know you, and will show you to the coffee and snacks! We gather for worship to connect with that which is biggger than any one of us - some of us call that God, others call it Spirit of Life or Great Mystery, others simply join in the energy that happens in the community. We gather to be renewed and re-centered on the ultimate purpose and meaning of life. Our services are respectful of our Christian heritage, and open to a variaety of religious and ethical traditions. Each Sunday service and sermon is unique and by attending more than once, you will be able to get a better feel for who we are and what we do. A typical service may include stories, scripture, readings and music selections from a variety of traditions. There is a sermon or message, a time for meditation and prayer, and several opportunities to join together in singing. Our part-time minister Rev. Laura Bogle preaches about 2-3 times a month. On other Sundays you may hear from a guest preacher, community leader or a member of the congregation. We are a multi-generational community and worship with all ages together. Each Sunday a kidspace is set up in the front of our worship space with activities to engage little ones, and allowing children to see and hear the service. We believe that an important way that children learn in our faith is by simply being an integrated part of the community and loved for who they are. Please visit the "Grow With Us" tab to find out more. What makes Foothills UU Fellowship different from other churches? Within our congregation you'll find a rich diversity of belief. 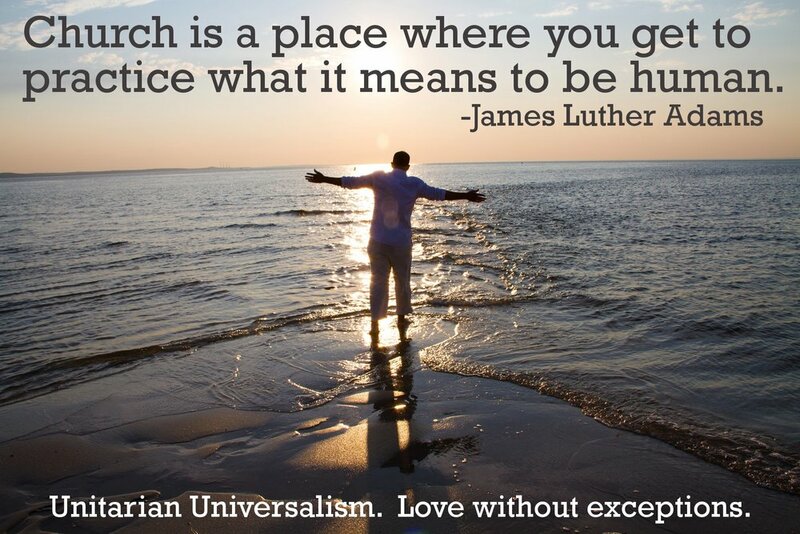 Unitarian Universalism emphasizes deeeds, not creeds. We sometime say that we are about Love beyond belief. Rather than subscribing to a creed, when you join our congregation you are joining an agreement, a covenant, to walk together in love. Within our church you’ll find a rich diversity of belief , and a congregation that supports one another in living out our values where we live, work and go to school. Please visit the “What We Believe” tab to find out more.